IN THE aftermath of the 1974 World Cup, English football was fascinated by Dutch and German football. England’s failure to qualify for that competition and the decline of league football into a physical, defensive product that had started to drive people away, meant that a lot of soul-searching had taken place. The conclusion was that English domestic football needed a lift. In 1975-76, there were signs that the industry was getting the message. Tommy Docherty’s Manchester United served up some of the best fare seen in years, West Ham were keeping with their tradition of attractive, but ultimately fruitless, football and Derby County, as reigning champions, were also keeping the purists happy. But the club that everyone was talking about as the season got underway was Queens Park Rangers. 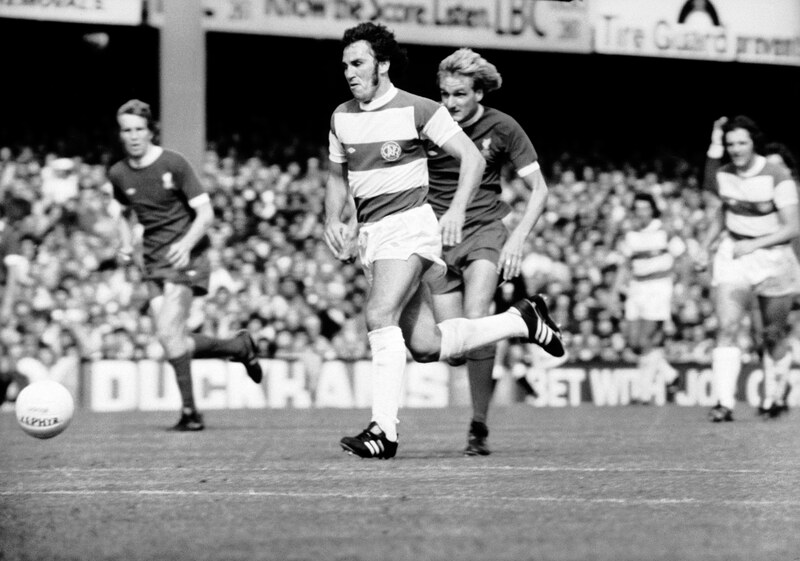 QPR was an unfashionable club, despite its proximity to the BBC, but in 1975, “the superhoops” represented the best that London had to offer. Arsenal, just four years on from their memorable double, were in decline; Tottenham, now without legendary manager Bill Nicholson, had struggled to replace an ageing team; and Chelsea were languishing in Division Two, hampered by player unrest and massive debts. QPR had former Chelsea manager Dave Sexton in charge and the quiet, cerebral man who won silverware over the other side of West London brought two of his team – David Webb and John Hollins – to Loftus Road. Sexton was one of the few English managers who made the effort to attend the World Cup in Germany and he was excited by what he saw. Always keen to experiment with continental methods, Sexton had never forgotten the Hungarian team of 1953 and when he saw the likes of Ajax and Bayern Munich, not to mention the Dutch and German teams that lit up the 1974 World Cup, he was keen to bring the concept of “total football” to England. At QPR he had a team that was equipped to serve up the most progressive football west of Hilversum. QPR’s squad was relatively small, certainly by the standards of the 21st century. The team picked itself. In goal was Phil Parkes, a huge man with equally large hair. So notable was Parkes’ hair that he was used to advertise Cossack, a gentlemen’s hairspray. That aside, he was a fine keeper and played briefly for England. The full backs, Dave Clement and Ian Gillard, also played for England. They were fast overlapping defenders with a bit of steel in their make-up. Hollins, Frank McClintock and David Webb brought immense experience to the team, but Sexton gave them all an Indian Summer in 1975-76. There was also youthful vigour in the form of David Thomas, a fast winger, and the new England captain Gerry Francis, who was never as impressive as he was in this memorable season. The guile and craft, not to mention headlines, were provided by Stan Bowles, a sublimely gifted, but flawed individual. He also had a stab at playing for England, but he was never going to win many caps in the era of Don Revie. Goals also came from Don Givens, a much underrated striker who played for the Republic of Ireland. Don Masson, a Scottish international, was a cultured midfielder who came to prominence late in his career. The rest of Rangers’ squad comprised journeymen like Mick Leach and Don Shanks. The starting eleven was arguably the best team in the First Division in 1975-76. QPR kicked off with a 2-0 win against Liverpool at Loftus Road. They followed that up with a 5-1 success at Derby, a result that stunned the media as much as it did the Baseball Ground. A typical headed goal by Webb enabled QPR to beat early-season pacesetters Manchester United 1-0 and it was not until October 4 that Sexton’s men lost their first game, at Leeds. It was tight at the top right up until the end of 1975 and a few frustrating results pushed Rangers down to fifth place at the turn of the year. From the end of January, QPR went on a superb run that included 11 wins and a draw in 12 games. On March 6, Rangers went top after beating Coventry 4-1 and after overcoming Manchester City 1-0, they were one point ahead of United and Derby and two in front of Liverpool. The media had now accepted that QPR could win the league. Some journalists – those that eulogized about European football on a regular basis – went as far as suggesting that QPR should form the nucleus of the England team and that Sexton was the man to lead the country’s troubled national side. Rangers barely put a foot wrong, producing some wonderful flowing football. But when they went to Carrow Road, home of Norwich, they were beaten 3-2, despite outplaying the East Anglians. It was a costly defeat that sent a signal of hope to the other clear challenger for the title – Liverpool. Rangers ended the campaign with a 2-0 win against Leeds United at Loftus Road. It put them top of the table with 59 points, but Liverpool – one point behind – had one game to play, against struggling Wolves. This finale was vital for both teams – defeat would send Wolves down, victory would enable Liverpool to deny QPR their first championship. It ended 3-1 to Liverpool. Rangers were destined to finish runners-up. Conclusion: The best team never to win the league? QPR certainly rank alongside the best sides to finish as bridesmaids. There wasn’t much wrong with the team, but it was never going to stay together for long. Why? Players like Hollins, McClintock, Masson and Webb were not in their prime and Francis was injury prone. Bowles was a mercurial talent, never likely to stay anywhere very long. And Rangers were not a rich club – they were always in danger of losing talent to bigger outfits. Sexton was also coveted, moving to Manchester United a year later. Basically, if he had been able to hold together his former club’s talent, QPR 1975-76 were what Chelsea 1970-72 might have become. QPR were great to watch and they deserved the title. It’s almost as tragic as Holland’s failure to win Munich ’74.